[Eugene, Oregon, USA] – Every Wednesday Anthony Carter, 15, suits up for practice. He throws on a T-shirt and joins the other boys as they sweat through 90 minutes of complex combinations, draining jumps and — on a hard day — upward of 200 push-ups. Afterwards, they head to the barre to decompress and leave feeling focused, energized and confident. Carter is one of the many ballet dancers at the Oregon Ballet Academy (OBA) in Eugene. In an industry dominated by women, tutus and tights, OBA offers a tuition-free, boys-only ballet program. For eight years, director John Grensback has been offering the class for boys ages 9 to 18. 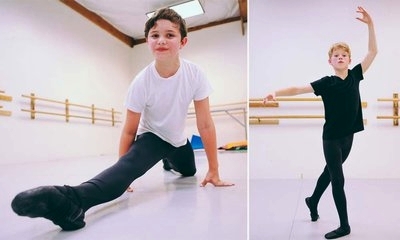 The weekly class incorporates technique and strength training and provides a comfortable and competitive environment for boys to explore ballet, work hard and, most importantly, have fun. “Girls are more focused,” Grensback says. “Boys have to have more fun.” As a young boy, Grensback studied ballet with other boys in Chicago before moving toward an illustrious 50-year career dancing professionally in the Houston Ballet, New York City Ballet and Joffrey Ballet. In many ways, the boys program allows him to give back to the community and teach the way he was taught. The class brings together boys of all different ages and skill levels and focuses on enriching ballet technique as well as strength and coordination. While about one-third of the boys join because they have sisters at OBA, many come to enhance their other interests. Rafael Batya, 11, hopes the class will nurture his passion for musical theater. Skeptical at first, Trystan Devouassoux, 14, joined to channel his creativity and challenge his coordination. For Carter, it was his genuine curiosity to see what all his female friends were fussing about: They are in agreement that ballet is much harder than it looks. In addition to providing extensive knowledge and skill, Grensback understands the challenges that men face in a female-dominated industry. “It’s really intimidating to walk into a room full of girls, wearing tights and not know what you’re doing,” says Nick Peregrino, 26. After being taken under Grensback’s wing at 18, Peregrino is now dancing professionally at BalletFleming in Pennsylvania. He believes that his ability to view ballet from a male perspective, a skill he learned at OBA, has given him an advantage over his fellow male performers. “A man’s job is to make the woman look good, and that’s ingrained in me,” he says. Grensback’s emphasis on being a strong partner gave Peregrino the confidence to be a “prince” to his female counterparts.